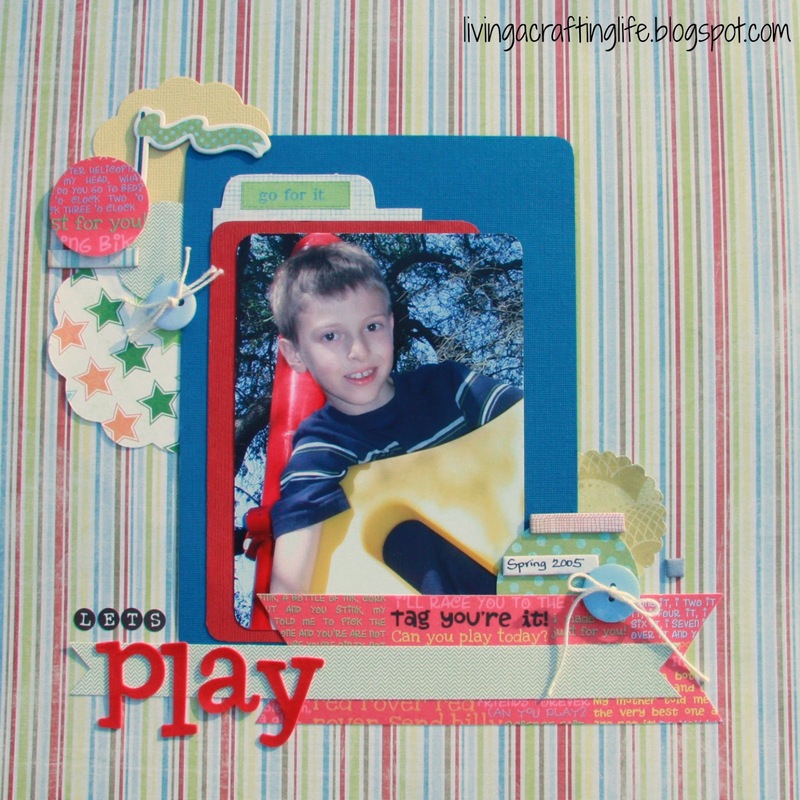 Living a Crafting Life: Scrapbook Process: "Let's Play" a Challenge! This weekend was fairly productive, scrapping-wise. I got quite a few layouts finished -- most with old photos that I had never gotten around to scrapping. Now that I am practicing more and more layering with my 12 x 12" layouts, I find that using one photo on a page is easier than ever before. This is a layout finished with some paper from Fancy Pants from a couple years ago that was in my stash and other scraps that I had left over from another layout. The Page Maps sketch I followed is part of the recent challenge over at The Memory Nest blog that ends tomorrow. Leslie also has a Design Team call at her blog too! If you've ever wanted to try out for a Design Team, this one would be a great opportunity. Details HERE. Deadline is May 28th. What did you scrap or make over the weekend?? Angie. I apologize for taking so long to visit. Love your take on the sketch and all the cheerful color. I recognize the flag. I had so much fun with those chipboard shapes. Thank you for linking up. Love when you play along. I could not find your email address, but congrats...Congratulations you’ve won a $25 gift card from BasicGrey’s National Scrapbook Day’s challenge. Email me at shara@basicgrey.com and I'll send you your code.